The New Year, which marks the transition of the Sun from Pisces to Aries, is the country’s prime national festival celebrated by the two major communities. It is a time for rejuvenation, sharing and caring and for giving and forgiving. As the Erabadu flowers bloom and the Koha sings the sounds of raban and firecrackers will renew our hopes for prosperity and reconciliation in the motherland. The Sunday Observer wishes its readers a happy and prosperous New Year. 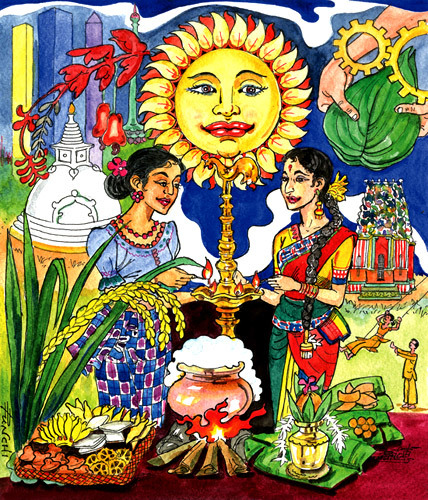 Illustration by Jagath Punchihewa.